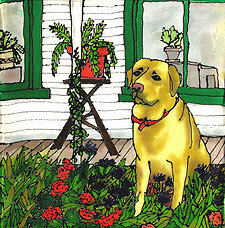 "In the Flower Bed, Again"
These catch phrases may describe Linda Eaton Marcille's silk paintings but not necessarily the artist herself, who battled advanced Neurological Lyme disease for six years before obtaining a diagnosis. Today, in addition to using her art as a tool for healing, she fights to raise awareness about this devastating disease. A native of Gaylordsville, Connecticut, with an interest in art from an early age, Linda studied photography after high school and spent the 1980s in New England and Hawaii pursuing a career as a free-lance portrait and art photographer. In 1993, she and her husband Don moved to a 25-acre homestead in the far north of Vermont and followed a very self-sufficient lifestyle. Linda's experiments with handmade paper during their farm days led to her creating a series of mono-prints and lino-prints to market at shows and galleries. Her work with the medium of silk began only after they sold the farm in 2000. Following several years living in mid-state, they settled in Brattleboro last May. "She creates her silk paintings using the highest quality steam-set French dyes, the finest crêpe de chine silk from China, and a one-of-a-kind resist made only in New Zealand. She has taken an ancient Asian art form and infused it with her own joyful and whimsical style. Painting on silk is an incredibly time-consuming and unforgiving medium -- just one drop of misplaced dye, or a broken resist line, and days of painstaking work are ruined. As challenging as painting on silk is, however, it is also one of the most rewarding art forms because the two-hour steaming process joins the fiber-reactive dyes molecularly with the silk, so the dyes take on the silk's iridescent sheen. It is because of this union that silk paintings are able to produce an awe-inspiring range of reflective color that no other medium is capable of creating." Linda's website has a gallery area with pictures of the colorful and charming vignettes for which she has become famous here and abroad. There are Vermont scenes in each season (most faithful portraits of particular places); a series with family pets, another featuring crows and other birds; several whimsical interiors, and five stunning paintings of jazz musicians doing their thing. In addition to the original silk paintings, limited editions of giclée prints are available. 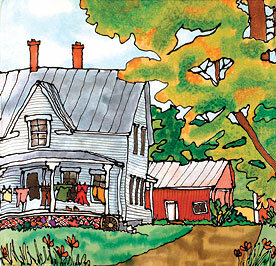 Custom silk renderings of people's homes are among the most satisfying of her painting projects to tackle. She also makes beautiful silk scarves and ties, and a line of colorful polymer jewelry, so there's something for everyone's pocketbook. 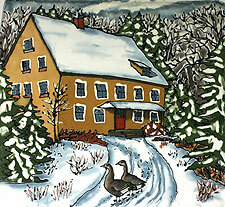 Linda's work has appeared in many publications, including Vermont Magazine. The current issue of Vermont's Main Streets & Back Roads sports her "Bridge on the Green" painting on its cover. 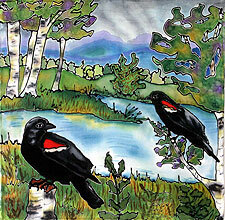 Original paintings and giclée prints are available in galleries throughout Vermont, including Linda's own Crow House Studio at 52 Belmont Ave. in Brattleboro, just across the road from Brattleboro Memorial Hospital. Linda's studio will be open on Gallery Walk weekends in November and December, 4 to 8:30 on Friday, 10 to 5 on Saturday and Sunday. Stop by for a refreshing splash of color! The location of Linda Marcille's home and studio just steps from BMH is a great convenience for the three days a week that she spends seeing doctors and undergoing tests related to her Lyme disease. This ongoing struggle, and her discouragement with the medical and political issues involved with the disease, recently led to her creation of the Lyme Awareness Art Project (LAAP). The project's website functions as a gathering place for the life stories, art, and poetry of Lyme sufferers. LAAP is also sponsoring the November 15 screening of "Under Our Skin" at 4 pm in the Latchis Theatre in Brattleboro, the film's last screening before its theatrical release in 2009. Director Andy Abrahams Wilson calls the film "a chilling tale of the pursuit of profit and prestige at the expense of science and very sick patients." A Q&A session follows the film with Pamela Weintraub, author of the book "Cure Unknown," and Lyme disease expert Dr. Rex Carr. Film attendees will also be able to view poetry and paintings generated by LAAP, featured in the Main Theater during November. Visit www.lymeawarenessartproject.com for further information.